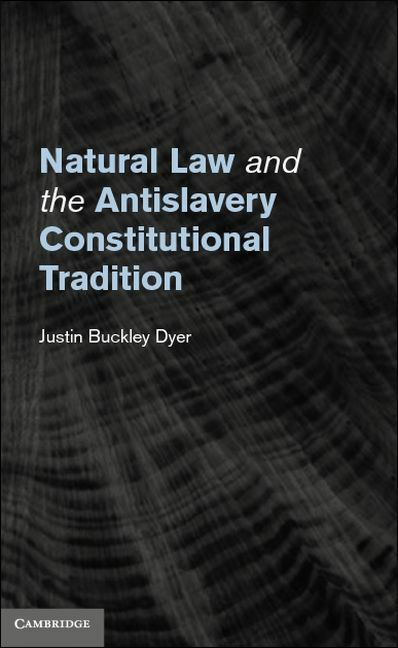 A very interesting looking book by Justin Buckley Dyer (Missouri), which in part defends the traditional view of the relationship between natural law and opposition to slavery against recent revisionist attacks: Natural Law and the Antislavery Constitutional Tradition (CUP 2012). The publisher’s description follows. In Natural Law and the Antislavery Constitutional Tradition, Justin Buckley Dyer provides a succinct account of the development of American antislavery constitutionalism in the years preceding the Civil War. Within the context of recent revisionist scholarship, Dyer argues that the theoretical foundations of American constitutionalism – which he identifies with principles of natural law – were antagonistic to slavery. Still, the continued existence of slavery in the nineteenth century created a tension between practice and principle. In a series of case studies, Dyer reconstructs the constitutional arguments of prominent antislavery thinkers such as John Quincy Adams, John McLean, Abraham Lincoln, and Frederick Douglass, who collectively sought to overcome the legacy of slavery by emphasizing the natural law foundations of American constitutionalism. What emerges is an understanding of American constitutional development that challenges traditional narratives of linear progress while highlighting the centrality of natural law to America’s greatest constitutional crisis.